Among soul music aficionados, the placement of the name “Hathaway” with the word “Live” automatically inspires heart palpitations, dizzy spells, and copious hosannas. Some of the best live soul music recordings ever made are those associated with Donny Hathaway. Soul capsules that capture a time and place with such immediacy, you’re instantly transported to those auspicious rooms where a musical church happened. Witnessing the miracle that can be Donny Hathaway’s daughter, Lalah, live when everything is aligned and she’s in the moment, can cause a similar transcendent experience to be evoked. Having seen people weep and an audience of thousands sway to a nine-minute version of “I’m Coming Back” with supporting singers Jason “JC” Morales and Toni "TJ" Scruggs joining Hathaway in a meditative moment that felt as close to a spiritual high one can have in a secular setting, I know the power that Hathaway is capable of conjuring and it is every bit magic. 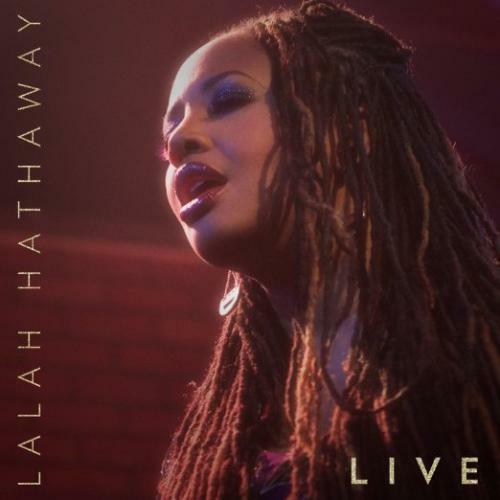 Which is why this live recording of Lalah Hathaway, the first full-length live project that is all her, can frustrate even as it can inspire awe in the skill and talent of its gifted source. The “Little Girl/Breathe” medley from 2008’s Self-Portrait fares better all around, with a now warmed-up Lalah Hathaway seemingly more energized by this more recent material than the older hits. In the slightly rushed, rotely performed way some of the early work gets delivered, there’s a sense that she’s perhaps grown bored with songs she’s perfectly sung a thousand times before. For their part, the supporting singers are all veterans who are some of the best in the business, including Jason Morales, Dennis “DC” Clark, and Vula Malinga of DivaGeek, but something in the way that they are recorded here does their blend no favors. On “I’m Coming Back,” usually a show stopping number, their voices clang and clash on crescendos when they should explode with harmonic and emotional clarity. The skillful simplicity of Toni Scruggs with Morales and Hathaway is missed as a unique blend. Some of the blame on the underwhelming backgrounds on this and other cuts belongs to Coobie Lewis, who mixed, and the Firehouse Recording Studios team of Josh Lewis, Jeremy Underwood, and Les Cooper who chose not to highlight in the mix the call and response interplay that is a hallmark of Hathaway when she’s in concert with her background singers, especially on a cut like “I’m Coming Back.” With the exception of the standout moment that is Luther Vandross’s “Forever, For Always, For Love,” these veteran voices are truly rendered far into the background in the mix, with only Hathaway’s voice fully brought to the fore, with little space or resonance. These production choices work best later in the set on cuts where Hathaway is suitably centered and everything else is expected to melt away and does. On the Joe Sample-Lalah Hathaway duet standard, “When Your Life Was Low,” Hathaway takes her time and gives it the elbow room the melancholy jazz-blues deserves. As with the entire project, it is the creaminess and autumn harvest that is Hathaway’s mahogany alto and contralto that makes some of the nagging issues worth it. On both “When Your Life Was Low” and the project zenith, “Forever, For Always, For Love,” Hathaway doesn’t rush it and she allows herself to feel the story that she’s telling, playing and riffing with all the church and jazz her voice embodies. The band and the background performances rise to meet her for both audience favorites, and are rewarded with an exuberant audience response that felt well-earned. Along with the three before-mentioned covers, these two songs illustrate the project’s possible heights. The inclusion of such esteemed - yet missing - mid-career material as “Boston” and “We Were 2” from 2004’s Outrun The Sky or “Let Go” and “What Goes Around” from 2008’s Self-Portrait might have further enhanced this uneven set, especially given the wealth to be found in Hathaway’s own two-decade plus catalog. To aid it all, a handful of new studio songs are also provided as bonus material on LIVE (five on the Best Buy version), with the profound self-help ballad “Mirror” being the most memorable and effective. They also collectively serve as welcome new material. With an album so organically musical and well sung, some will take issue with this somewhat critical review of such an eagerly awaited project by one so beloved. Be clear, compared to what is currently in the marketplace, discovering this album is akin to striking oil in the Dakotas. Lalah Hathaway’s enormous talent and technical proficiency are all evident throughout and Hathaway at 80% is better than too many to name at their fullest throttle. Still, once one has borne witness to what is possible at a Hathaway show, whether that setting be a huge venue like DAR Constitution Hall in DC, an intimate room at BET Studios, or in a jazz room with Joe Sample at Yoshi’s in the East Bay, California, what’s captured here often falls short. Hopefully, it is enough to inspire listeners to go and see Hathaway live for themselves, to gain a fuller sense of what’s possible and the spiritual atmosphere Hathaway fans have long observed. Perhaps the potential success of this project will encourage Hathaway to make more than one live recording, outside of the revered guest spots on Marcus Miller’s and Kirk Whalum’s respective concert recordings. Her own legacy, independent of her father’s, certainly deserves it. Recommended.